This frontier style powder horn is polished to a high shine. 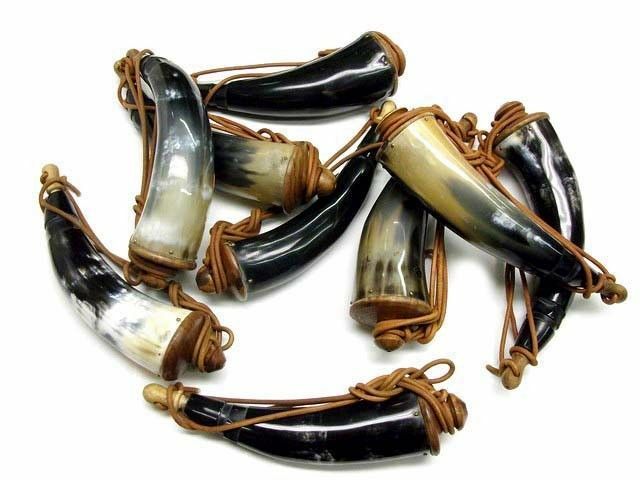 It is made from genuine horn and comes with a wooden plug on one end and a wooden acorn cap on the other. The shoulder sling is a 1/4" leather cord. Picture shown is representative of the variety you may receive. Most of the horns are solid black, but varying degrees of white or cream marbling may occur. Degree of marbling and shapes may vary slightly from those shown in the picture. Average length - 8 1/2" long x 2" wide. Sizes and colors pulled at random. This early American frontier style reproduction would be period correct for living history events from the early 1600s to the late 1800s.